Fibreglass tanks are less common than plastic tanks and it is typically harder to find a wide range of shapes and sizes. However, they have some advantages over plastic tanks such as greater heat resistance. Round fibreglass tanks cost about the same as plastic tanks, but custom-made tanks tend to be more expensive and harder to find. Fibreglass tanks are light, resistant to rust and chemical corrosion and can also tolerate extreme temperatures. They are more resistant to UV radiation than plastic tanks and therefore should last longer in direct sunlight. However, they tend to let in more sunlight than other tanks, which could result in algal blooms. Fibreglass tanks are easy to move because the rigid nature of the material makes their walls relatively thin. Fibreglass tank may crack as they are quite brittle, however they can be easily repaired. The range of fibreglass tanks on the Australian market is smaller than for plastic and steel tanks, therefore it is harder to source slimline and alternative size options. Fibreglass tanks are made with a food-grade coating on their interior surface and should be manufactured to prevent light entering the tank. The coating should be cured prior to the tanks being offered for sale. As a composite material, most fibreglass tanks are not recyclable and will most likely end up as landfill. They contain a lot of polyester resin and small amounts of toxic substances such as the catalyst used to make the resin set, which are released as the material degrades in landfill. Like all other tanks, however, fiberglass tanks can and should be put to other uses. For example, large tanks can be turned into storage sheds, provided they are given adequate structural bracing. 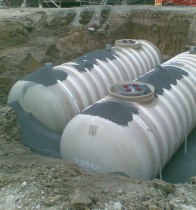 Compacted packing sand is generally fine for fibreglass tanks, but if you have rigid fixed plumbing and large tanks it may be worth considering a reinforced concrete base to avoid movement. The tanks were at the house when I bought it 12 years ago. Still no leaks or taste problems. Slight sign of sun minor cracks on top of fibreglass tank. Happy with both. Ten years old and apart from fading it is all good.